I hope I’ll only be showing rings for another week, but if I find I really do have enough fabric to make the quilt bigger, this may go on for two or three more weeks. 6 x 7 rings. Still need to sew the 4-patches on two sides. Based on the amount of fabric I bought, I was intending the quilt to be 7 x 8 rings. I wouldn’t mind it being 8 x 8 or 8 x 9 rings, but I don’t know how much extra fabric I’ll have when it reaches the original size. Check out other’s design walls over at Judy’s blog. I have always wanted to make a DWR quilt I am just way to intimidated by templates to even try yet. Yours is beautiful! That's beautiful and just my colors! Wow, it's looking wonderful. I've never tried a DWR, but it's on my want to list. 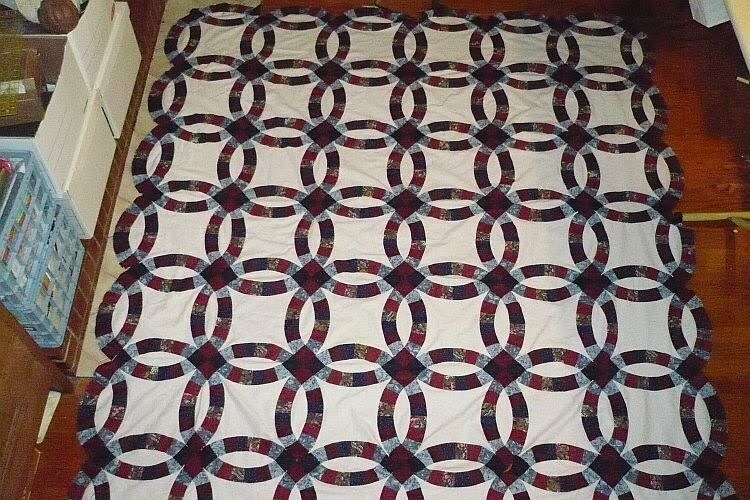 Nice to see someone making a Double Wedding Ring quilt. I used to teach a class for the quilt. People seem scared of making one. Wow! This would take me YEARS to sew! WOW, you have really made some serious progress! Great job!